Distribution: In the United States, walleye are native to the Great Lakes and St. Lawrence River Drainage south through the Mississippi River basin to Alabama and Arkansas. Their native distribution includes most of central Canada, from the Northwest Territories to western Quebec. Walleye were introduced into New Hampshire presumably from Lake Champlain and are now abundant in the CT River from Monroe to Hinsdale. They are also occasionally caught in the lower Contoocook and Merrimack Rivers. Description: Torpedo shaped body with large mouth and sharp canine teeth. Eyes are large and pearlescent with reflective pupil. Two well separated dorsal fins, anterior spiny and posterior soft rayed. Tail fin is moderately forked with lower lobe edged with white. Coloration is olive to dark brown on back, yellowish brown to brassy green with dark mottling on sides, and a white belly. The large, reflective eye of the Walleye is an adaptation for feeding in low light conditions. Habitat: Walleye live in both lakes and rivers in a variety of conditions, but they thrive best in turbid waters because their eyes are sensitive to light. This is also why they primarily feed during low light conditions. Walleye prefer a firm bottom consisting of sand, gravel, or rock, and can be found around vegetation but not in it. They are considered a “cool water” species preferring colder water than bass but warmer water than trout. They use structure such as boulders, sunken trees, vegetation, and thicker layers of snow and ice to shield themselves from sunlight. Fish are the primary forage of walleye, followed by invertebrates. 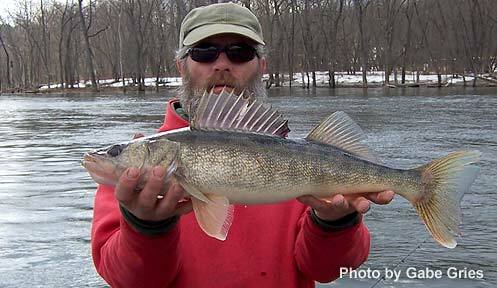 Life History: Walleye begin moving toward spawning areas in late winter and early spring. In rivers and streams the spawn takes place in flowing water over rocky bottom below dams or impassable falls. In lakes, spawning occurs over rocky shores in depths less than six feet. Males move into these areas first followed by the females. Spawning mainly takes place at night and a single female is attended by several smaller males. Fertilized eggs fall into the cracks and crevices and stick to the rocks and debris. The number of eggs produced by individual females varies depending on size and physical condition, but typically 23,000 to 50,000 eggs are produced per pound of body weight. The eggs hatch out in 12 to 18 days depending on water temperature. Conservation/Management: In the Connecticut River, walleye are managed through a slot limit that was implemented in 1998. “No person shall take walleye 16 to 18 inches; the daily limit is 4 fish, of which only 1 can be larger than 18 inches”. All measureable objectives of the slot limit were proved to be met during the 2008 and 2009 CT River Walleye Creel Survey. All other water bodies in the state have a two fish limit with a minimum length of 18 inches. Continue to manage walleye populations for recreational angling. In the spring, fish the tailraces of dams on rivers and the mouths of tributary streams. Use jig heads (from ¼ oz. to ½ oz. depending on flows) with curly tail grubs or other soft plastics tipped with a live shiner. Drift this presentation along the bottom so it just bounces off the bottom and drifts with the current. In summer months, trolling proves to be the most popular method to fish for walleye. Anglers typically use crawler harnesses with night crawlers that are attached to bottom bouncers to get them to the bottom. Crankbaits trolled or cast are also very effective for walleye.